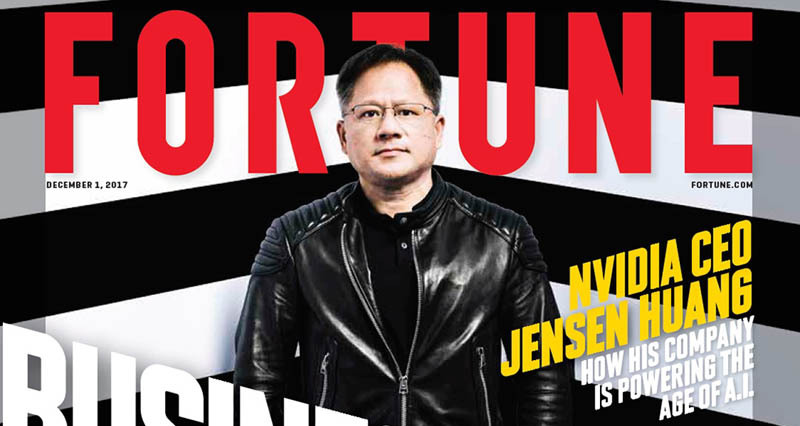 Highlighting NVIDIA’s accomplishments — and its extraordinary culture — Fortune magazine Thursday named NVIDIA’s Jensen Huang its 2017 businessperson of the year. “The co-founder and CEO of semiconductor and software maker NVIDIA saw the future of computing more than a decade ago and began developing products that could power the Artificial Intelligence era,” Fortune’s Andrew Nusca writes in a story featured on the cover of the triweekly magazine’s latest issue. Huang joins a select group of business leaders who have been so honored by one of the world’s most storied business magazines. They include Facebook CEO Mark Zuckerberg, Nike CEO Mark Parker, Alphabet CEO Larry Page, Tesla and SpaceX CEO Elon Musk, Amazon CEO Jeff Bezos and Starbucks CEO Howard Schultz. It’s a list that’s as much about highlighting the work of the world’s most iconic companies as the names who lead them.